A top House Democrat filed a lawsuit on Wednesday to end 501(c)(4) tax treatment of groups that ostensibly engage in political activity, but said that Organizing for Action (OFA), the (c)(4) that evolved out of the president’s campaign apparatus, is not one of those groups. "My understanding is that [OFA], as currently constituted, is not engaged in spending money to directly defeat or elect candidates," said Rep. Chris Van Hollen (D., Md.) in a conference call announcing the lawsuit. "They are not therefore engaged in that kind of direct electoral campaign activity," Van Hollen added. The congressman is suing the Internal Revenue Service (IRS) over its treatment of (c)(4) groups, which he said are legally required to "exclusively" conduct activity classified as "social welfare." The IRS currently requires that groups be engaged primarily in social welfare activities, which has come to mean that a majority of their activities fall into that category. In practice, that means that (c)(4) groups must devote at least 51 percent of their resources to activities that the IRS deems in the service of "social welfare." 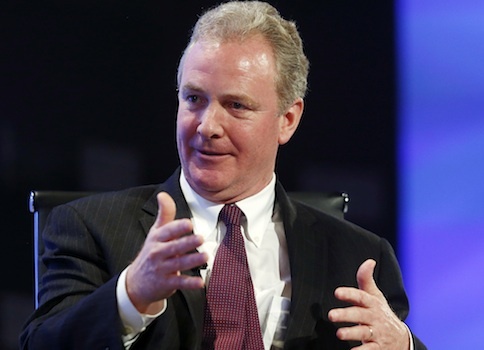 Van Hollen's suit aims to establish a 100 percent social welfare requirement. "When you’re spending money to directly elect or defeat candidates, that clearly is political activity that is in violation of the plain meaning of the statute," Van Hollen insisted. OFA executive director Jon Carson recently encouraged Democratic donors to contribute to the Senate campaign of Georgia Democrat Michelle Nunn. The group’s chairman, former Obama campaign chief Jim Messina, huddled with the Democratic Party’s campaign arm "about mobilizing Obama supporters in Republican-held districts in races the party hopes will be competitive, according to a Democratic official," Politico reported earlier this month. Van Hollen said (c)(4) groups "can certainly be involved in educational issues, informing people about issues," as he claims OFA is. While OFA continues to deny that it is engaged in political campaign activity, even though groups that support Van Hollen’s effort have warned that OFA has blurred that line. A representative from Public Citizen, which has joined Van Hollen’s lawsuit, told Politico that the group "should be careful." "What you can’t do is cross the line into advocating for or against candidates," said Public Citizen’s Lisa Gilbert. "They are straddling the line with the way they are organized, and they need to be careful that they stick to issue work." Other observers have stated plainly that OFA is a political operation, and should be treated as such. "Clearly OFA is now engaging in political activities," said Sen. Jim Inhofe (R., Okla.) in a news release last week announcing an investigation into the White House’s coordination with the group. OFA has been criticized since its inception for what some see as a scheme to sell access to the president to high-dollar Democratic donors. The group denies that it serves that purpose. This entry was posted in Politics and tagged Barack Obama, Chris Van Hollen. Bookmark the permalink.